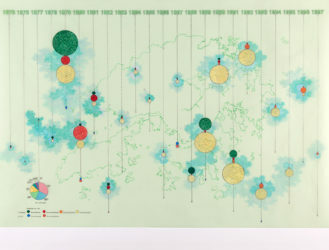 Tiffany Chung (Vietnam/USA) is noted for her cartographic drawings, sculptures, videos, photographs, and theater performances that examine conflict, migration, displacement, urban progress and transformation in relation to history and cultural memory. She is one of Vietnam’s most respected and internationally active contemporary artists. In 2019, the Smithsonian American Art Museum will present Tiffany Chung: Vietnam, Past Is Prologue, a major solo exhibition responding to the Vietnam War and its legacy on the culture and population of the United States. The exhibition will feature a specially commisioned video works along with photographs, watercolors, texts, and hand-drawn maps that trace military strategies and refugee resettlement patterns. Chung’s interest in imposed political borders and their traumatic impacts on different groups of human populations has underpinned her commitment to conducting an ongoing comparative study of forced migration – through both the current Syrian humanitarian crisis and the post-1975 mass exodus of Vietnamese refugees, of which she herself was a part. At Art Basel Hong Kong 2016, she presented the international debut of the first part of The Vietnam Exodus Project, with an installation of new works focusing on the experiences of Hong Kong’s Vietnamese refugee community. 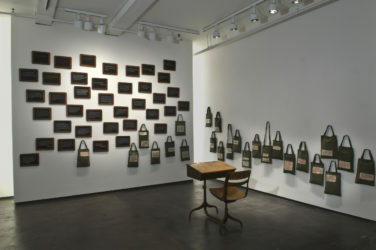 Cartographic drawings – addressing such issues as the international flows of refugees, demographic statistics, and the network of detention centers and refugee camps in Hong Kong – were shown alongside a multi-media wall installation incorporating images, written inscriptions, videos, and electronic texts. 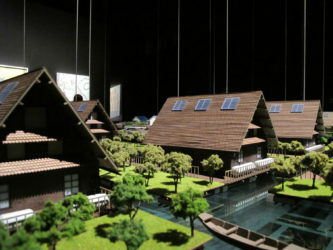 By unpacking the Vietnamese refugees’ experiences and tackling the asylum policies applied towards them in the past, the project aims to give insights into the impact of constant shifts in asylum policy-making on already traumatized and distressed people, particularly those from the current global refugee crisis. In 2017, Tyler Rollins Fine Art presented the unwanted population, a solo exhibition featuring recent developments in The Vietnam Exodus Project, The Syria Project, and The Global Refugee Migration Project. Chung’s work studies the geographical shifts in countries that were traumatized by war, human destruction, or natural disaster. 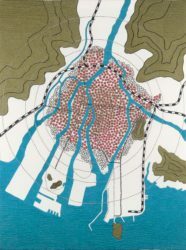 Her map drawings layer different periods in the history of devastated topographies, reflecting the impossibility of accurately creating cartographic representations of most places. Transgressing space and time, these works unveil the connection between imperialist ideologies and visions of modernity. 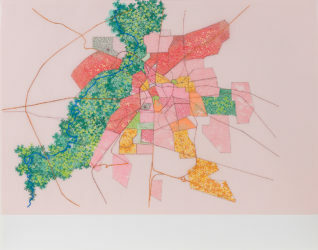 Her maps interweave historical and geologic events – and spatial and sociopolitical changes – with future predictions, revealing cartography as a discipline that draws on the realms of perception and fantasy as much as geography. Exploring world geopolitics by integrating international treaties with local histories, Chung’s work re-maps memories that were denied in official records. Based on meticulous ethnographic research and archival documents, her work excavates layers of history, re-writes chronicles of places, and creates interventions into the spatial narratives produced through statecraft. 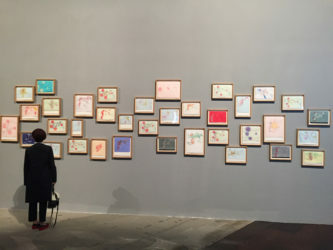 Chung’s work was featured in the 2015 Venice Biennale, in the exhibition All the World’s Futures in the Arsenale, with an installation of 40 map-based drawings relating to the ongoing crisis in Syria. The works’ richly detailed surfaces, with jewel-like tones rendered in ink and paint stick on translucent vellum, belie their somber thematic content charting the country’s ever expanding cycles of violence and refugee displacement. In 2018 she participated in the Sydney and Gwangju biennials as well as museum exhibitions in Hong Kong, Zurich, and San Francisco. In the United States, she has presented four solo shows at Tyler Rollins Fine Art (2008, 2010, 2012, 2015) and has appeared in such museum exhibitions as: Insecurities: Tracing Displacement and Shelter, Museum of Modern Art, New York (2016); My Voice Would Reach You, Museum of Fine Arts, Houston (2014); and Six Lines of Flight, San Francisco Museum of Modern Art (2012). She was awarded the 2013 Sharjah Biennial Prize honoring her exceptional contribution to the biennial. Chung is a co-founder of Sàn Art, an independent, artist-initiated, non-profit gallery space & reading room in Ho Chi Minh City. In December 2018, Tyler Rollins Fine Art will present a solo booth of her work at Art Basel Miami Beach. 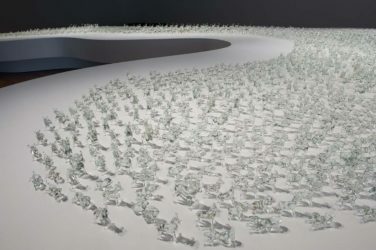 Tiffany Chung’s solo exhibition Vietnam, Past Is Prologue at the Smithsonian American Art Museum in Washington, DC will take place March 15 – August 25, 2019.